Through our needs assessment and discussions with the council we saw that there was a clear lack of social cohesion in the Loughborough community, which is something we definitely wanted to address. In addition, we also saw that Fearon Hall, a local community center in the heart of Loughborough which has been a integral for the community for decades was struggling to stay afloat. As a team we saw an opportunity to provide necessary funds to Fearon Hall to continue to do the great work it does as well as raising the social cohesion in Loughborough. Our answer: running a social cafe in Fearon Hall which takes food waste from supermarkets and 'Utilising' this into healthy meals (and they are really tasty too). Our mission is to provide an environmental, economic and social benefit to the local community. We aim to intercept waste food from retailers and wholesalers diverting it into our cafes, we also seek to work alongside Love Food Hate Waste to encourage customers to reduce their food waste at home. The pay as you feel element to our model ensures that those who need a hot meal, have access to it. The revenue we do generate goes to Fearon Hall a local community centre or back into the project allowing it to develop and grow. Finally, the social environment in which our café’s run allows the community to come together and to improve the student-local relations. 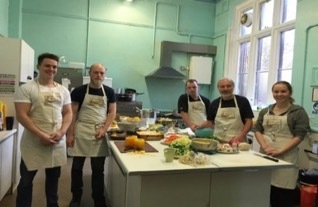 So far, we have already served 745 people healthy tasting meals, made over £1500 and stopped 693kg of food going to landfill and we are only just getting started. We have already started to run our project weekly with the aim to providing more funds for Fearon Hall and using more and more food waste.